Summer is coming, along with that comes the heat. We all know to stay hydrated but most of us forget about the condition of the bike. Tires running on on 200+ Degree blacktop need to be at the correct psi. Read the side of the tire fir the correct inflation for that tire. Don’t assume you know. Also stay on top of oil changes, heat is the biggest enemy of oil degradation. If you’re headed out of State, remenber to check all the laws in each area you travel through. Guns, helmets, handlebar height if you have Apes, and dont forget to keep your phone charged and water in the bike in case if a roadside emergency. With so many events coming this summer it will take careful planning to ensure you have places to stay, highpoints along the way to visit, you will be glad you did. My advise would be to take some time and venture out. If you never have, ask someone that has. The memories, people you meet and the sights and smells are unbelievable. There is a lot out there to see besides a bar stool in the Creek. All to often we slip into the same routine week after week, one day we wake up and realize the year is almost over. As I get older and realize how many friends have passed on, too early in my mind, it makes me stop and rethink my vacation destinations and some of the habits I need to break or alter, after all we never know when our time is up. 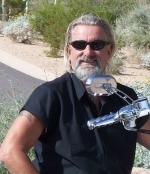 I will be headind to the Pikes Peak Bike Week towards the end of June and then maybe back to Colorado for the Cripple Creek Music Festival to get out of the heat.